A vegan family is at risk of losing their home in Crowborough, East Sussex, after saving a pig they've named Arlo from being slaughtered. 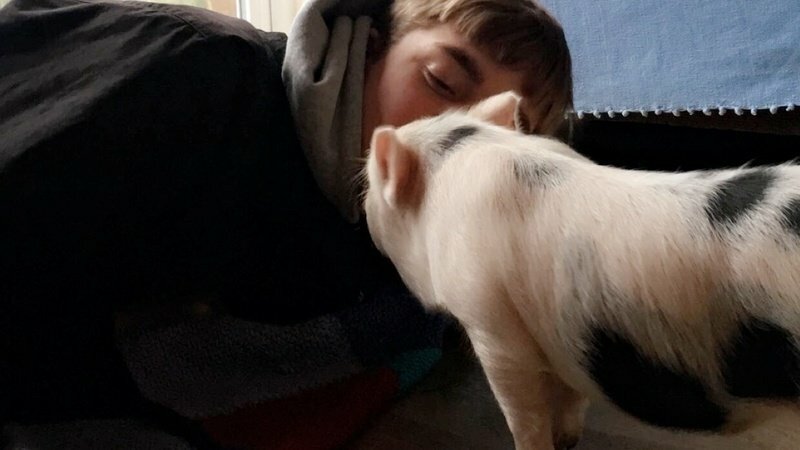 The Williams family, who paid for the pig's owner, have been informed they're breaching the tenancy of their council home - following an alleged complaint filed from a neighbor. Georgie Williams told the Metro: "When we first got Arlo home I couldn't get anywhere near him because he was so petrified. He would just stare at the wall. If you came near he would run away and scream or flinch like you were going to beat him. We had to coax him into letting us stroke him. "Now he's so happy with us. He lives for cuddles and tummy rubs and sleeps next to me every night. He is just like a cat or a dog. He's been through so much trauma, he's not ready for a sanctuary. He's not emotionally stable yet. He will still scream if you walk up behind him or even if a bird lands in the garden." The family has since started an online petition to 'protect Arlo' which has received over 1,000 signatures. Teddi Williams, who started the petition, said: "Although a majority of people believe Arlo deserves a happy and settled life the council does not and they have given us two weeks to remove Arlo from the property before they do. This is due to a neighbor reporting Arlo's presence although he has and never would do anything to harm anything or anyone. "What he does do is stops my mum's mental health from deteriorating. He helps subdue my panic attacks and stressful episodes by burrowing close to us. This is not an animal that deserves to be thrown in a slaughterhouse. So please, if you don't believe in saving all of them I'm begging you to find a place in your soul for just one." East Sussex County Council has been contacted for comment.